Is it too late to do a wrap up of my weekend? I don’t think so! It didn’t seem like it was a very busy weekend, but it seemed to fly by. Don’t they all? So, Saturday morning Karl and I went to pick more blueberries. This time we went to a place called Butler’s Orchard in Germantown. 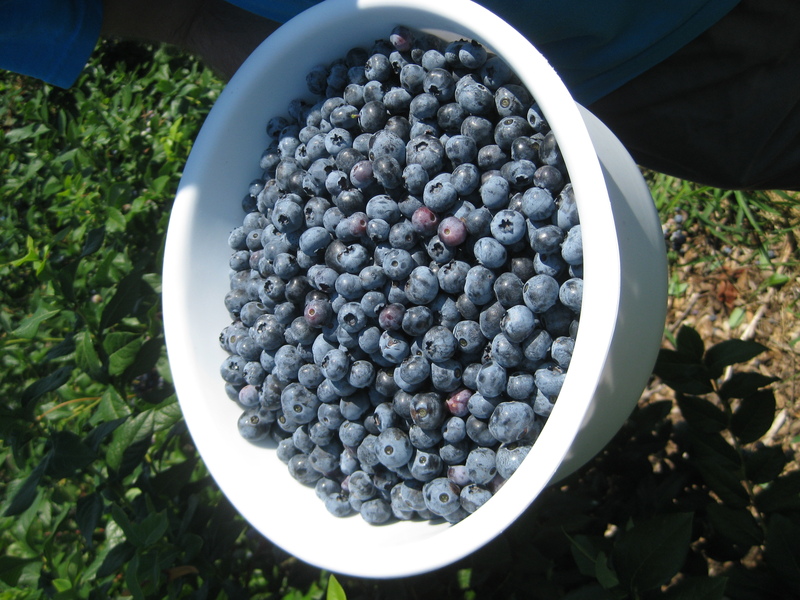 The blueberry picking was amazing this weekend! They were so plump, and every branch was full of ripe berries. 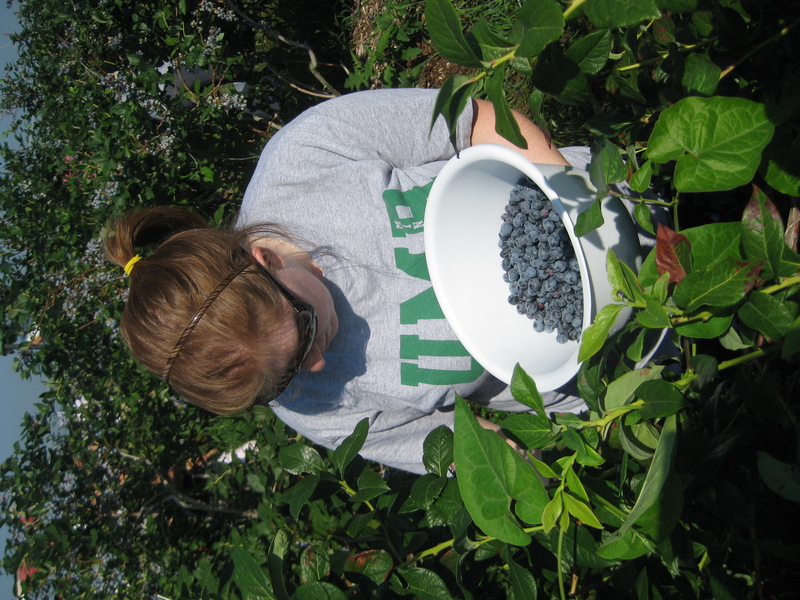 Picking is so much fun when there are so many good berries to choose from! We filled our bowl with 6.66 lbs (kind of a freaky number, right?) and finally said we had to stop. Then we came home and Karl did some car stuff while I cleaned. In the afternoon we went to Bed, Bath, and Beyond and got the ice cream maker attachment for our Kitchenaid Mixer!!!! I am so excited about it. We were definitely disappointed to find out that you have to freeze the mixer bowl for at least 15 hours before using it though! Sunday we got up early to do our grocery shopping. First to Wal Mart and then to Sam’s. We were at Sam’s when they opened at 10AM. Did you know that people line up to get in there before 10? I’ve never been there that early before so I definitely did not! I was pretty excited because it was time to renew our membership. No, I was not excited about spending $40. I was excited because we got an offer in the mail that said if we renewed by a certain day we could get a $20 gift card. Then, on the way in, I saw a sign that listed a bunch of companies and said “if you work for one of these companies, you can get a $10 gift card for renewing your membership.” The company that Karl and I work for just happened to be listed on there! I figured that you could only get one deal or the other, but it doesn’t hurt to ask for both, right? Well it turns out you can get both! So I spent $40 on a membership but got back $30 in gift cards. I’d say that’s quite a deal! We got back home and immediately got to work making our first batch of ice cream! It was a lot more work than we thought it would be. We definitely learned to follow directions too… Like when they say to refrigerate your ice cream batter overnight, they don’t mean stick it in the fridge for 2 hours and call it good. You will end up with runny ice cream. We eventually got a pretty good product for our first try though! 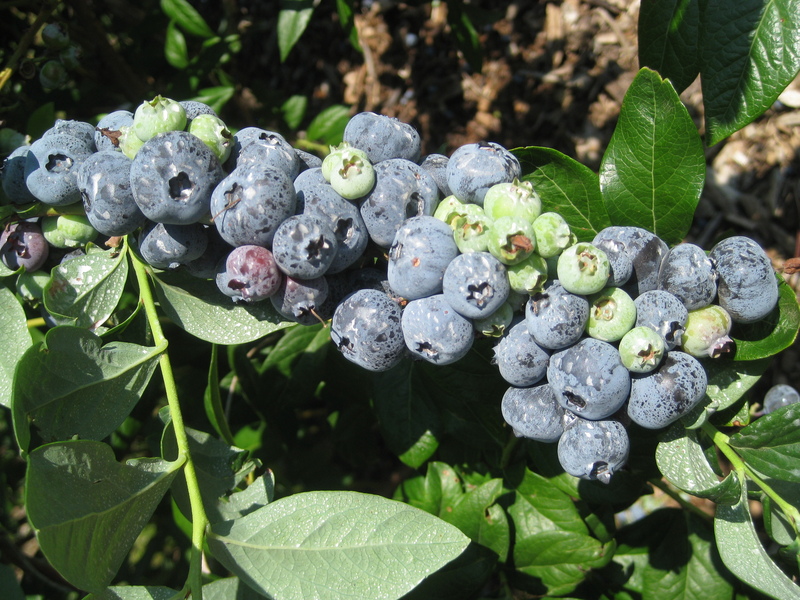 I am thinking about making some blueberry sorbet or frozen yogurt in the next few days so hopefully I will have that post to share with you soon. 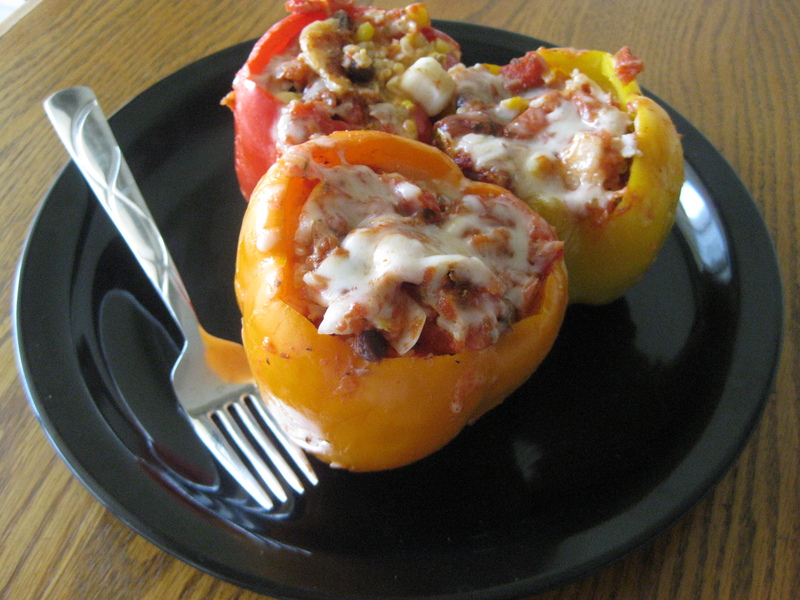 On Sunday I also made some vegetarian stuffed peppers and had my first attempt at macarons. I have read so much about them online and couldn’t understand how a cookie could be so difficult to make. Apparently I didn’t something wrong though because the cookies turned out flat as pancakes! I will have to do a little more researching and try them again soon. 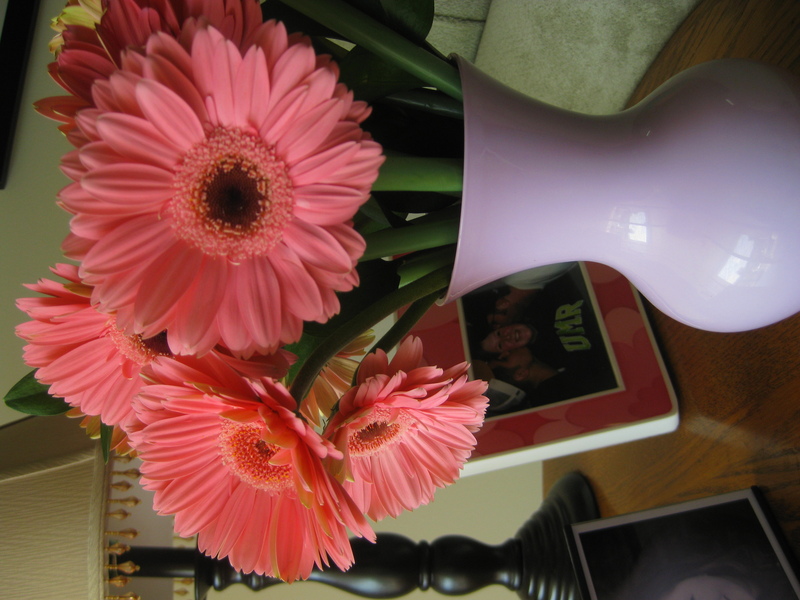 One of the best parts of my Sunday was getting surprised by my wonderful husband with some cute pink daisies! 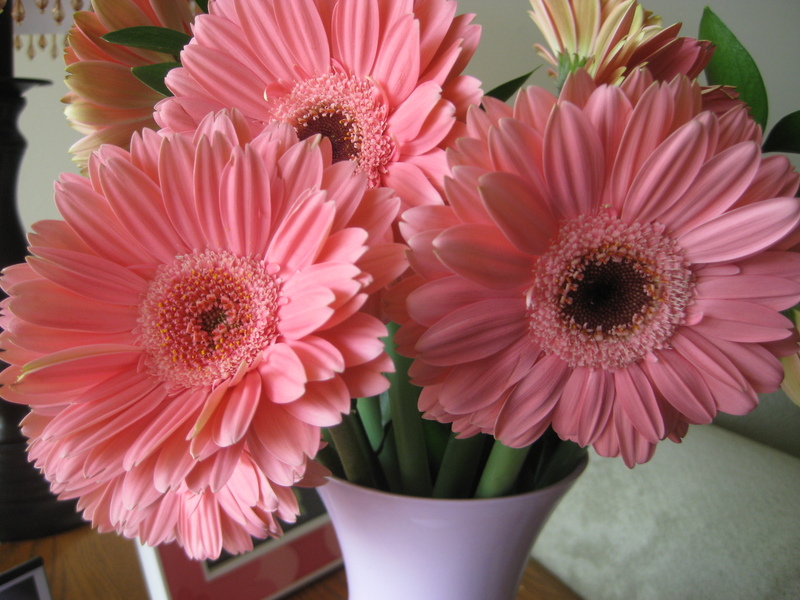 He always asks when we go to the store and pass by the flowers if I want some, but there’s nothing like getting them by surprise! 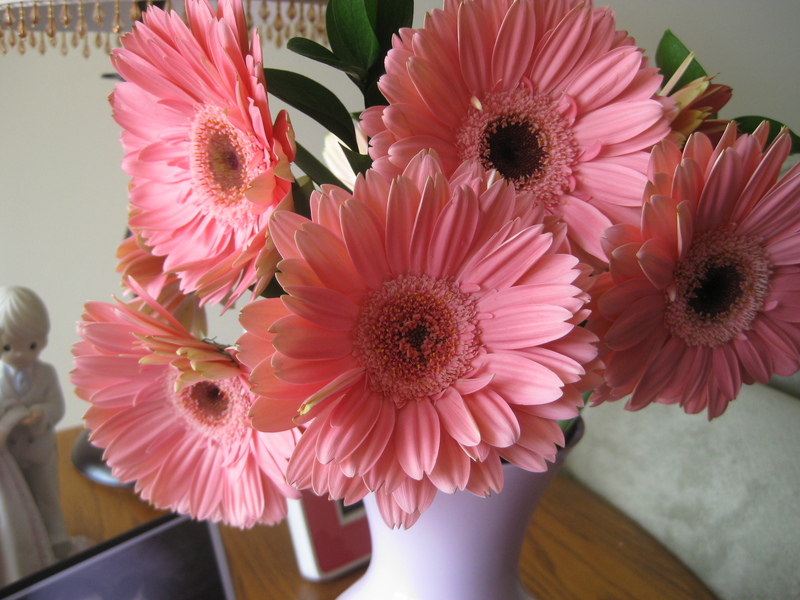 He is such a sweet heart – I am a lucky woman! I hope you all had a great weekend and the week is off to a great start! Only 3 more days until the next weekend!